NEW YORK—The Federal Reserve Bank of New York today presented an update on the economic conditions in the Second District region, noting a slowdown in the pace of recovery. In New York City, economic activity was essentially flat during the fourth quarter of 2010, after an expansion of 2.5 percent over the first nine months of the year. Also in the fourth quarter, employment in the District increased by only half of the national average of 0.3 percent. 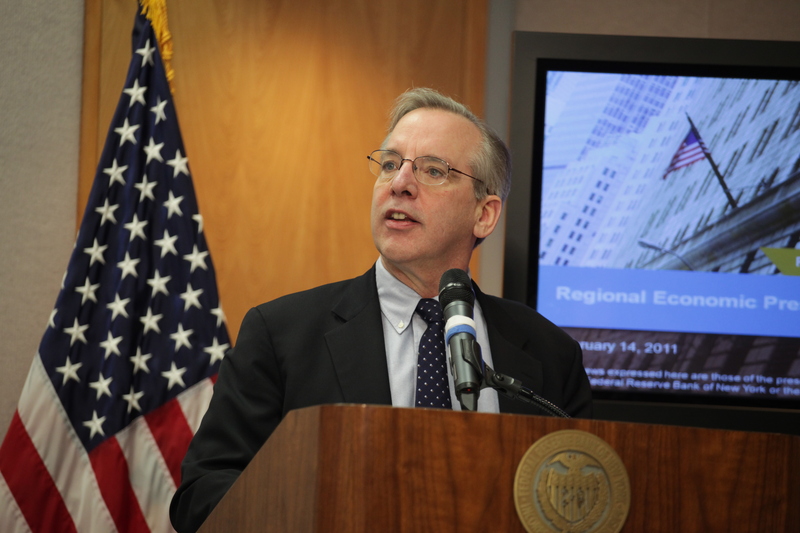 “It’s too soon to tell if the loss of momentum in regional growth will continue. However, soft patches similar to this one are not uncommon during times of recovery, so we should not be too pessimistic,” said William C. Dudley, president and chief executive officer of the Federal Reserve Bank of New York, at today’s Quarterly Regional Economic Press Briefing. Also today, the New York Fed released the Quarterly Household Debt and Credit Report for the fourth quarter of 2010, which showed consumer debt levels continuing downward at the national level—a trend noted for the previous eight quarters—and relatively low debt levels across much of New York and New Jersey. Refer to the complete report for details on the United States and other select states. Across the region, the report showed that household debt levels—measured in terms of the debt-to-income ratio—are well below the national average in upstate New York and New York City, but above the U.S. average in Long Island, parts of northern New Jersey and Puerto Rico. Since the majority of consumer debt is housing related, higher levels of debt are generally more concentrated in parts of the region that experienced the most rapid increases in home prices during the recent boom. An exception is New York City, which has lower debt levels largely because the majority of households rent their homes and do not take on mortgage debt. The deleveraging process in the region, whereby consumers reduce the amount of debt they owe, has proved milder than elsewhere in the nation, even though it is severe by historical standards. In part, this is because debt levels are not as high and did not rise as rapidly preceding this period. Notably, there has been little, if any, debt reduction throughout much of upstate New York, where debt levels are already quite low. Despite the region’s relatively mild deleveraging, delinquency rates are high in some places—particularly, in New York City and Long Island—indicating that many households remain under significant stress. Delinquency rates in upstate New York and northern New Jersey, though somewhat elevated, remain below the national average. In Puerto Rico, delinquency rates have edged above those experienced on the mainland. During 2010, households in many parts of the region began seeking and taking on some forms of new debt, after a period of decline. Across the region, there was an increase in credit inquiries in 2010, suggesting that the demand for credit has started to increase. In New York, northern New Jersey and Puerto Rico, auto debt is increasing—a signal that households are once again beginning to increase spending on durable goods and are willing and able to borrow to do so. “Greater household demand for credit and an increase in spending bodes well as another step toward economic recovery in our region,” Mr. Dudley added. 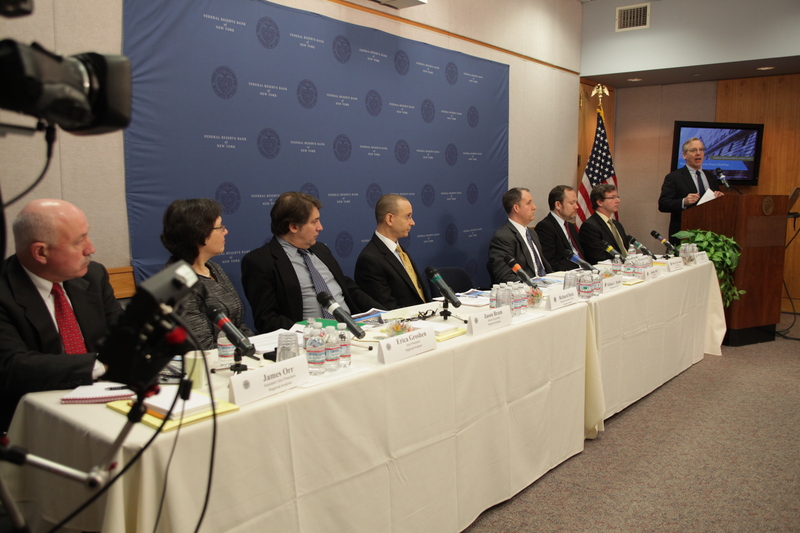 Media who cover the Federal Reserve’s Second District—which includes New York, northern New Jersey, Fairfield County, Connecticut, Puerto Rico and the U.S. Virgin Islands—are invited each quarter to attend a briefing by New York Fed regional research economists on a variety of subjects relevant to the regional economy. The New York Fed’s Quarterly Regional Economic Press Briefing Series began in April 2010, with a briefing on regional employment trends. It continued in July 2010, with a briefing on the regional manufacturing sector, and in October 2010 on the regional housing sector. The next briefing is expected to take place near the beginning of this summer. This New York Fed’s Quarterly Household Debt and Credit Report is aimed at helping community groups, small businesses, state and local government agencies and the public to better understand, monitor and respond to trends in borrowing and indebtedness at the household level. The household debt and credit report is updated quarterly and includes such categories as the number of bankruptcies, per capita debt levels, total debt levels and composition of debt, new originations of installment loans, total balance by delinquency status, foreclosures and new delinquencies by loan type for the U.S. and select states. The report is based on data drawn from the nationally representative random sample in the New York Fed’s Consumer Credit Panel. Sections of the report are presented as interactive graphs on the New York Fed’s Credit Conditions web page and the full report is available for download. The next quarterly reports are expected to be released on May 9, 2011; August 8, 2011, November 14, 2011; and February 13, 2012.